If you need to create content offline using Microsoft Word (M.W.) and then paste it into WordPress, this article will show you how to do it correctly and avoid any ugly styling issues that might occur. 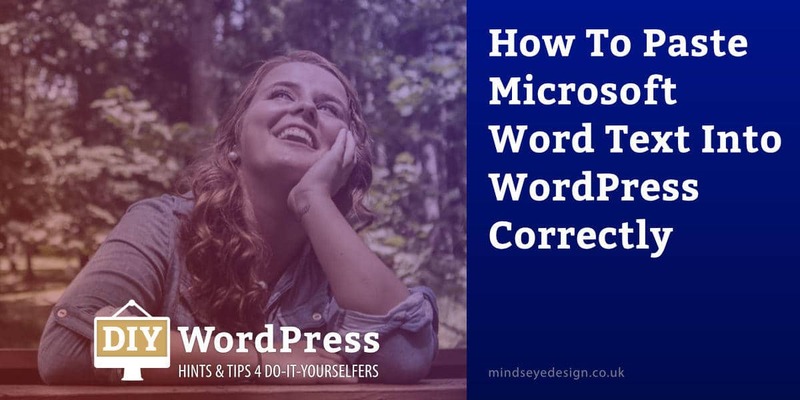 Quite often, WordPress beginners write all their words in Microsoft Word and then copy and paste the text straight into their WordPress Editor. This seems an obvious thing to do but often all the formatting is replaced by randomness on the WordPress page! Frustrating and confusing to say the least. The problem is that the formatting used by other programs is not always compatible with WordPress. So, when you copy the text from Word you’re also copying the formatting and this is when the randomness can occur. There are two ways around this and the first is obviously to write all your text directly into your WordPress Editor. You can always save the Post or Page as a Draft and come back to it later, so this is the method we use and advise. However, if you still have to use M.W. due to being offline for example, read on. By clicking the ‘Paste as Text‘ button before pasting content from elsewhere, all previous formatting will be cleared from your copied text when you paste it into the visual editor. Your content will now be ready to reformat using the WordPress Visual Editor instead. Where do I find this magic button? The ‘Paste as Text’ button is located in the Kitchen Sink, which is the second line of formatting options revealed when clicking on the ‘Toggle Toolbar‘ icon on the Editors’ Toolbar. Before pasting any text, simply click this button to remove all formatting and paste your content as plain text.